Summer is the perfect time for visiting a Farmers Market. Especially when you are lucky enough to live near a great Farmers Market, like the Renton Farmers Market. For the first time this season, Renton Farmers Market is accepting SNAP benefits and allowing shoppers to make purchases using EBT in addition to WIC and Senior Farmers Market Nutrition Program vouchers. Thanks to a lot of hard work from market manager Carrie Olson and her team, accepting SNAP at the Renton Farmers Market allows everyone in our community to have access to fresh, healthy food! Renton Farmers Market is the first city-run market in the state to accept SNAP, demonstrating remarkable support for low-income members of the Renton community. “I’ve noticed a lot of happy surprise from customers…many customers are excited to shop at the market now, because they were unable to before if they only had SNAP,” notes Oscar Bernal, Farmers Market Assistant for the SNAP Program. Through our partnership with the Renton Farmers Market, F$ is also dedicated to supporting new SNAP shoppers at the market. A fun activity at the Food $ense info table on Kids Day. 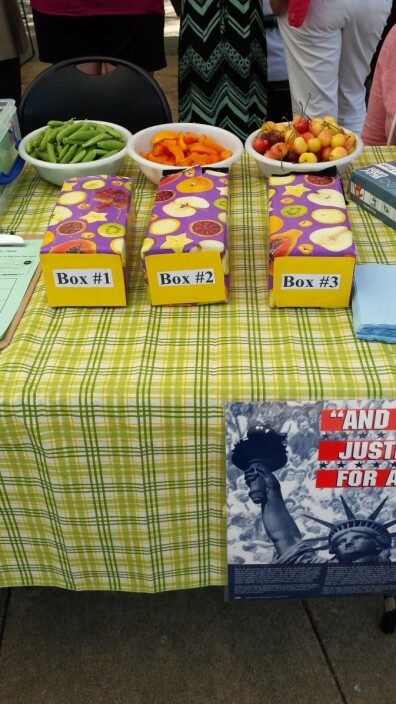 A mystery seasonal fruit or vegetable was placed in each box and kids were asked to identify it using only their sense of touch. Then they got to try a sample! Each week F$ staff hosts an information table for shoppers using SNAP, WIC, and SFMVP benefits with tons of great recipes and tips for getting the most for your money at the market. The recipes feature many of the delicious fruits and vegetables grown here in Washington. Want to know what to look for when you’re buying zucchini? F$ also offers information on selecting and storing fruits and vegetables for best quality. F$ Educators Erin and Anna demonstrate a Strawberry Spinach Salad recipe at the market in June. In addition to the information table, F$ is also providing recipe demonstrations to promote using Farmers Market purchases to make budget friendly recipes. F$ chooses seasonal produce from the market to prepare a SNAP approved recipe and pass out samples. While preparing the recipe, F$ educators promote using SNAP, WIC, and SFMVP benefits at the market. Additional nutrition information, cooking tips, and recipe variations and ideas are also included in the presentation. The audience always has great questions and suggestions to offer. Last but not least, F$ also offers market tours full of tips on saving money at the market. Starting at the WIC voucher table and the market manager booth where SNAP benefits are administered, we invite shoppers to walk around the market and share ideas for shopping on a budget. 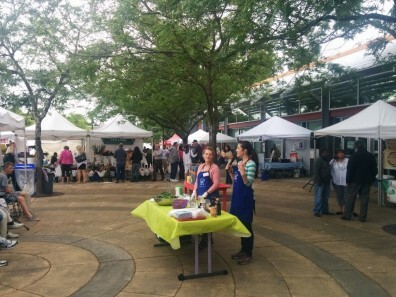 We love to see our learners engaging with the sights, sounds and flavors of the market. Thank you to the Renton Farmers Market for creating such a welcoming and fun environment for everyone! For more information, please contact Anna Kitchin.